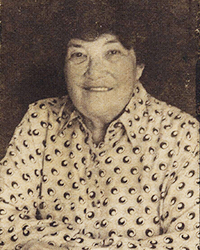 Hannah (Schmidt) Burstein was born on January 8, 1922 in Tarnow, Poland to Mendle and Amalia Schmidt. She had four brothers and one sister. After the Nazi invasion, Hannah and her family were forced into the Tarnow Ghetto. From there Hannah was sent to Plaszow concentration camp with her father who perished there. She was then sent to Auschwitz. Hannah was liberated from a labor camp in Czechoslovakia in May 1945. After the war, Hannah married Paul Burstein, and they had a son. They immigrated to El Paso, Texas. Hannah died in 1995.